I feel like it took me a long time to finally get my hands on this book. I put in a request for it at the library as soon as it appeared on the short list for the Rogers Writers’ Trust Fiction Prize. I had made up my mind to read them all. I had already read All My Puny Sorrows and The Confabulist. Then, Pastoral came right away, Girl Runner only just arrived a few weeks ago, and I haven’t heard a peep yet about All My Saints. I might have to give up on that one. So much for reading them all before the winner is announced! The narrator of Girl Runner is Aganetha Smart, a 104-year-old woman, looking back on her life as a daughter, sister, friend, and runner. Above all, a runner. Let me just say, though, that you do not have to be a runner to enjoy this book, or to ‘get it’. You just need to love a good story. All my life I’ve been going somewhere, aimed toward a fixed point on the horizon that seems never to draw nearer. In the beginning, I chased it with abandon, with confidence, and somewhat later with frustration, and then with grief, and later yet with the clarity of an escape artist. It is far too late to stop, even if I run in my mind only, out of habit. You do what you do until you’re done. You are who you are until you’re not. Girl Runner fills that ever-existent hole that calls out for a good story about someone else’s life. Aggie’s memories take us back to her childhood on the farm with her family; her siblings, her parents, the little graveyard full of unknown relatives. Then, to the big city of Toronto, her training, and her race in the 1928 Olympics in Amsterdam. Aggie moves through her life with determination, always with the feeling that she doesn’t quite fit in. While rooting for her in her life as well as her races, I longed to ease her way in the world. Her voice is very human; at times scrappy and strong, other times lonely and uncertain. It wasn’t strength that made me a runner, it was the desire to be strong. I ran for courage. How does a person die? Is it like a window gone dark, shuttered? Does a person keep looking at this world until the very last second of life, trying to take it in and understand it at last, or simply to hold it, to attend to it, to love it? Or does a person stare in dreadful panic of all she is losing? The appearance of perfection does not interest me. It is the illumination of near-disaster beside which we all teeter, at all times, that interest me. It is laughing in the face of what might have been, and what is not. I think of everything my mother does not know about me. Everything she never will. Yet I fail to consider everything I do not know of her. Everything I never will. My achievement is to have lived long enough to see my life vanish. 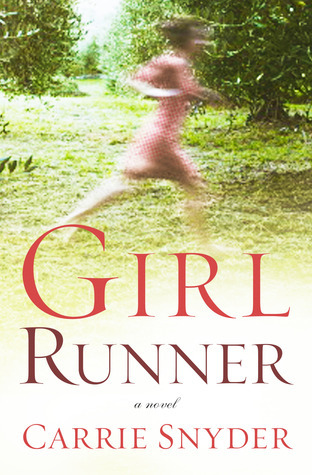 Girl Runner spans almost the entire 20th century. It touches on both wars, the Spanish Influenza, the Stock Market Crash of 1929 and the Depression that follows, as well as the changing views of women’s issues over the decades. In addition, there is some history of women’s athletics, particularly in Track and Field events. Aggie runs in the first Olympics to include female track and field. Her event is the 800-meter race, which immediately gets eliminated again due to the fear that women are too delicate to race distances over 200 meters. “It wasn’t until the 1960 Olympics in Rome that women were again allowed to compete at the 800-meter distance”. Carrie Snyder talks, with passion, about the women competing in the Olympics then and now, in the Author’s Note at the back of the book. Reading this section made her book that much more meaningful, and gave me a greater understanding of why she felt compelled to write it. You can find out more about Carrie Snyder, her books, and her blog at Obscure Canlit Mama. 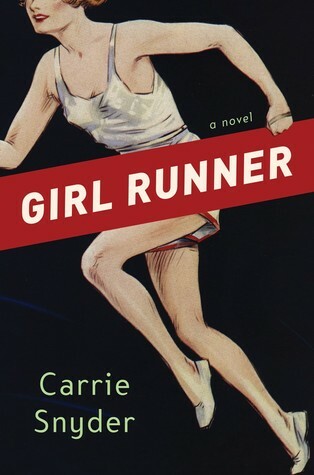 Here, Carrie Snyder talks briefly about some of the books and characters that have influenced her writing of Girl Runner. Among them, Hagar from The Stone Angel, which I have just finished reading, and couldn’t help but notice the similarities between the two books. Advice to an aspiring writer from Carrie Snyder’s blog. Review of Girl Runner in the National Post. C.J.’s review of it on her blog, ebookclassics. Books about the Olympics. You got me. I’ve been waiting to read this one. I thought more people would be talking about it. Perhaps a sleeper hit? I have heard people talking about reading it, but I haven’t see many reviews for it. I don’t know why. I thought it was great, and including some history of the Olympics and women’s athletics in general made it a bit different. And, believe me, you don’t have to be an athlete to think so, because I am not! Thanks for linking to my review! Now that you’ve read the book, do you feel it was worth the wait? I’ve seen this one around but I had no idea what it was about until your review. And now I want to read it! Bonus: the cover is beautifu! And I’m a sucker for any book that takes a trip to Amsterdam. I like the cover, too. But, to be honest, there is not a lot about Amsterdam in it, mainly the Olympics. You should totally read it anyway, though! It’s good! Thanks for the heads up. I will still keep it in mind. I love both the covers of this! It sounds really great, too, I’ll have to keep my eye out for this one! Yes, do! It deserves to be read! I remember wanting to read this ever since I saw CJ’s review. Now I have to get it! I’m not an athlete but my son is, and I am very interested in stories in which people push themselves to their limits. I feel I need to do more of it. This sounds like an inspirational story. I think this is one you would like, Cecilia, and some parts are inspirational, but her life also has loneliness and disappointments. One thing I liked about it was that it was a realistic look at a very long life. So, even though, she was celebrated for her athletic achievements, that was only one small part of her life. Like Us Conductors, I think Girl Runner also has wide appeal. It is just such a good story, from beginning to end. I hope you enjoy it! I completely agree with you when you say that “you don’t have to be a runner to love it”. I think that this is completely true. Not only did I love, but I could connect to everything about it. The characters, the plot. the emotions. I felt really connected to this inspiring book about a forgotten olympian. That is saying something with regards to that I am not a runner. This shows that although she was determined to win, she had empathy for others, like Glad. I think that your point about why Carrie Snyder decided to write a novel like this one. She used her own motivation, determination to write this wonderfully put together novel and I agree with everything that you think about this inspiring novel to read. I do think the author was able to show her determination and independence, as well as her self-doubt. She felt very real to me. So glad you liked it!